Going with a friend to Blackwood, NJ in a few weeks to help her bring some of her late father's possessions back to MI. So, I figured we would be crossing the AT at some point. Looks like it will be on the Pennsylvania Turnpike east of Carlisle. Is anyone familiar with this area as to where we can get off and go park for a 2-3 hr out and back hike? go to the ATCs web site and use their interactive map. You can turn on a layer for trail head parking. As long as you do not run into too many rocks, PA is usually not too bad as far as elevation. Some nice scenery in places too. I remember doing a 20 mile day to get to a motel/hotel stay in Carlisle, so should be reasonable walking in that area. The post was edited 1 time, last by Astro ( Apr 29th 2018, 4:44pm ). The town of Boiling Springs isn't far from Carlisle,PA and the trail goes right through town. The Appalachian Trail Conservancy has a regional office there and you can probably get any info you need from them. As I remember, there is plenty of parking and the hiking in either direction is pretty easy. I have had my husband dump me out for a hike right at the bridge that takes the AT across the Turnpike. There is a pulloff in both directions, a path and a break in the fence so I am sure I am not the only one to hit the trail this way! Your best bet for a dayhike from Boiling Springs would be to get off at the Carlise exit and head to the ATC office. I've done that too. Anytime I drive to the east coast I know I will be crossing the AT somewhere so I check the map to see where that would be. Last time was on I 77 near Bland VA en route to Raleigh. Once we crossed in eastern PA, parked at the Bake Oven Knob parking, and hiked up to Bear Rocks. I picked blackberries and my wife still complains about the rocks, even though it was 15 years ago. If you get off the Turnpike at the Carlisle interchange and take Route 11 north, you'll drive about two miles before you get to the footbridge carrying the AT over the highway. Middlesex Diner is on the left before the footbridge and would be a safe place to park and grab a bite to eat with all of the truckers. Heading north from Route 11, there are a few rolling fields before you reach the mighty Conodoguinet Creek. Heading south, the trail is often in a narrow right-of-way corridor surrounded by farm fields and McMansions. From the Turnpike, there is a pull-off on the WB side just before you cross under Appalachian Drive where the AT uses the road bridge. I didn't see any pull-offs on the EB side on Google Maps. Logistically speaking, you should be able to cover 6 - 9 miles in 2 to 3 hours. Starting at Route 11, you could go north to Route 944 and back (8.6 miles) or south to Trindle Road and back (7.8 miles). Now that is what I would call a really good answer! It's not often that someone is asking questions about the part of the AT in my greater neighborhood. And I just drove under the AT Sunday afternoon on the Turnpike. I look forward to hiking that flat farmland. Seriously what is wrong with you? What happened to useless ups and downs (PUDS)? Why not hike across Kansas? Where is the excitement? 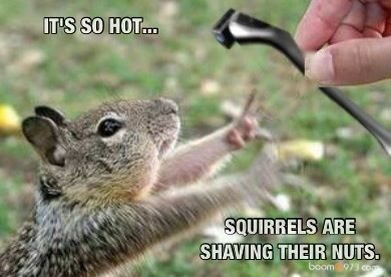 I would rather get my favorite rodent dinner nuts shaved than hike farmland. [IMG:https://i.pinimg.com/originals/69/3f/04/693f045dbd4c086fd9a76ad9b6d64cf7.jpg] It's a Joke son, says Foghorn Leghorn. If you are not laughing... you clearly are too young. From my experience if you have hiked long enough you will welcome a flat stretch. Elevations with views are great, but the body appreciates a break too. Seriously what is wrong with you? What happened to useless ups and downs (PUDS)? Why not hike across Kansas? Where is the excitement? I would rather get my favorite rodent dinner nuts shaved than hike farmland. [IMG:https://i.pinimg.com/originals/69/3f/04/693f045dbd4c086fd9a76ad9b6d64cf7.jpg] It's a Joke son, says Foghorn Leghorn. If you are not laughing... you clearly are too young. The secret to life some say is balance. I printed out all your responses and shared them with my friend last night. We are both excited about our mid-day hike which will take place on either 5/17 or 5/18 depending on when we are able to leave. Thanks to everyone for the info shared; much appreciated! First Saturday home in 4 weeks. I'm happy to report that the hike in PA actually took place. On May 17 after taking car of a lot of business in NJ with my friend's late Dad's car (lawyers office, DMV, lawyers office, DMV, Dad's house in Blackwood, car towed to dealer 20 miles away), we headed back on the turnpike to the outskirts of Mechanicsburg. Stayed at an Econolodge. I had inadvertently reserved a smoking room and there weren't any similar non-smoking rooms available but Mr. Patel graciously upgraded our accommodations at no extra charge. Mike, the maintenance man, gave a suggestion of the Sunlight Diner on Gettysburg Rd just north of Wesley Dr. It was OUTSTANDING! Matt the Chef made us a very delicious dinner: Bourbon Pork Chop over cheddar mashed potatoes with garden salad. He came out and spoke to us and when he heard I was going to hike the AT the next day, he said he would make a special breakfast for me and he didn't disappoint, it was GREAT! My friend had a pineapple back at the motel that she wanted to cut but forgot to bring a knife or anything to cut it on. I asked Matt if he would consider letting us borrow a knife and plate overnight and he sharpened a special knife for her. Hook had just gotten out of the Army, his last official day was the day before but he'd been hiking for about a week and a half. He had been stationed at Ft. Campbell, KY. I thanked him for his service. He started in Harpers Ferry and wasn't sure how far he was going. Originally, he was going to flipflop, then he thought he would just hike to Katahdin and call it good. Last thought he had was to finish up PA and see how he felt. He was missing his girlfriend. They'd all started hiking at Springer separately in late Feb/early March. Impact had a gorgeous head of hair!!! Several people seeing these pics observed that Poncho has a set of guns. I thought Poncho was from the northeast, likely the Boston area, and I was right, he's from just south of Boston. HotTang is from Muskegon, MI. Turned out he is Zero and is the younger brother of Impact. Impact and another brother were leaving in late Feb for the AT and 2 days before they left, Zero decided to join them so he hurriedly acquired some gear and off he went with his brothers. He graduated from HS a year ago. I crossed the bridge over the PA Turnpike and finally came across some elevation, as slight as it was. Was VERY surprised that up until that point my hike had been basically FLAT! Just another 1.2 miles to the footbridge over US 11. My friend was in a parking lot at Middlesex Diner that someone had mentioned above so she came and picked me up and we headed back to the motel. I headed straight to the bathroom to wash off the accumulated dirt and sweat off my hands and lower arms. Then after admiring all the bikes, I joined her in the discount section where I found a pair of $110 jeans marked down to $41.50. Tried them on and they fit very well. When I took them to the register, the clerk exclaimed that they must be mismarked and called over a manager, who after taking one look, ran over to the shelf I found them on and scooped all the rest off and took them to a backroom to reprice. So, I ended up with a whale of a deal. After a quick shower, we then headed to Hershey. I'd never been. I'm glad I went but will never go again. Too many people, it was total chaos. Then back to Sunlight Diner for another tasty meal. ps Hope my pics brought back some memories to those of you who have hiked this section. pps. Say hi to the gents if you happen to see them up in NY or CT, although with 2 wks under their belts, I wouldn't be surprised if they're close to MA. Thanks for the great trip report and photos! great report. I haven't hiked around there, but I did grow up in MD so lots of those places are familiar. You just hiked the easiest part of the AT in PA! No Rocks! Who knows, maybe after completing NH and ME this summer I might not complain so much about the PA rocks. That's a mythical place you tell hikers with sore feet about to give them hope and keep them going. Hi TJ, Here's the thread I started last year when I was going to be traveling through Pennsylvania last May. Received some good advice; see above. Had a GREAT day hike! I recommend doing the same route that I did which starts just outside Boiling Springs heading north for about 8 miles to US11. See my trip report above. It is a very flat section with none of the famous Pennsylvania rocks. Hope this helps! What you have heard is true, and I probably even have a few little scars. Definitely know they are also slippery when wet. They clean out the rocks from the woods by throwing them in the trail. I don't think I ever want to hike the section from Wind Gap to Fox Gap again. Scratch that... I KNOW I don't want to hike it again.